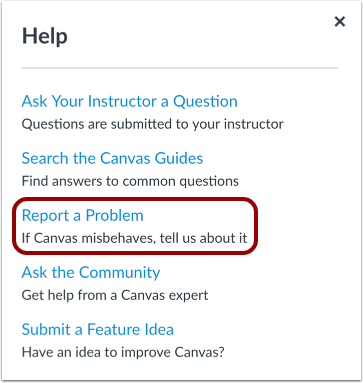 You can get help with Canvas by using the Help menu. 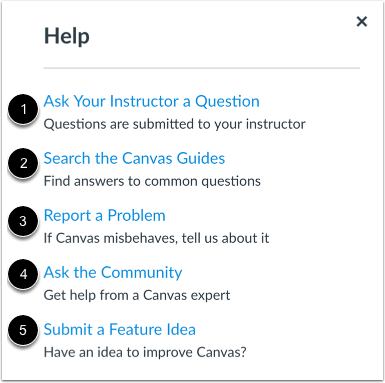 The Help menu generates a list of resources to help you with Canvas. 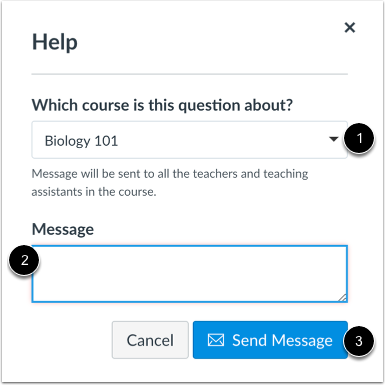 Canvas displays links according to roles in all enrollments; for instance, if you are a student who had one courses with an instructor-based role, the Help menu will show you links available to students and instructors. This lesson outlines the five default help links that may be included in the Help menu for your institution. However, your institution may customize the Canvas Help menu to hide default links and create custom links as resources. 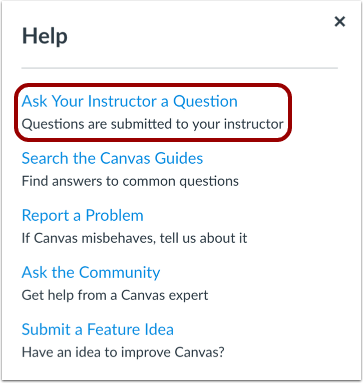 The Ask Your Instructor a Question link allows you to contact an instructor or TA in any of your active courses directly from the help page. The Search the Canvas Guides link helps you search Canvas documentation for information about features in Canvas. 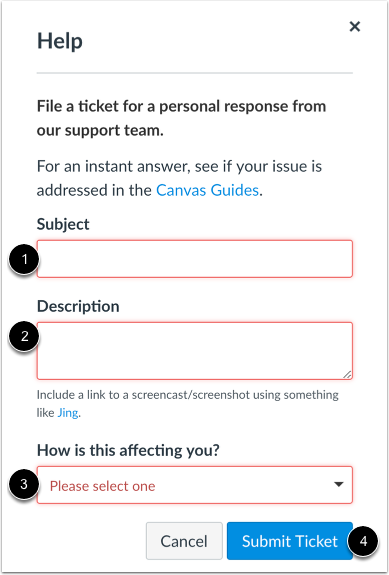 The Report a Problem link helps you report problems in Canvas. 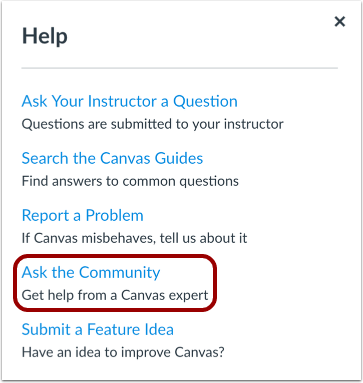 The Ask the Community link allows you to collaborate with other members of the Canvas community for answers to Canvas questions. 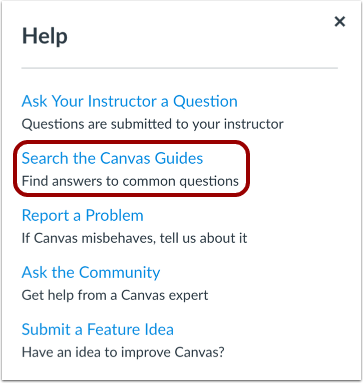 This link directs to the Find Answers space in the Canvas Community. 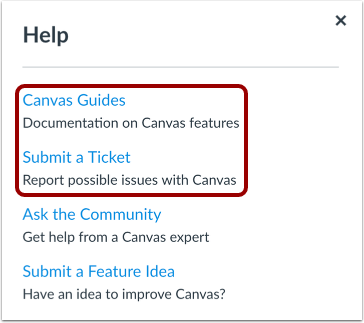 The Submit a Feature Idea link allows you to submit feature ideas to Canvas. 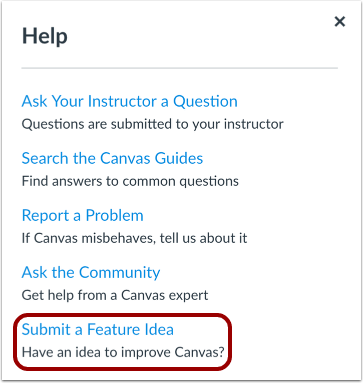 This link directs to the Feature Ideas space in the Canvas Community. Previous Topic:How do I view my institution's Public Course Index as a student? Next Topic:How do I log out of Canvas as a student? Table of Contents > Global Navigation > How do I get help with Canvas as a student? Re: How do I submit my quiz if its not letting me?